Drag Specialties steel tubing stick-style handlebars feature low, aggressive styling with zero end rise or pullback. The bars measure 30” wide and are available with dimples in a smooth, unknurled style and notched for Throttle by Wire (TBW). Available in chrome, gloss black or flat black. These top-quality levers are made of lightweight aluminum and feature a late-style wide, flat design. They are compatible with OEM clutch and brake lever perches. Available in chrome or matt black finish for ‘14-’16 FLHTCUTG and ‘15-1’6 FLRT. 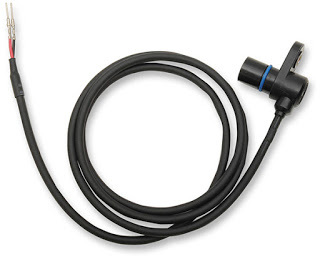 These high-quality replacement sensors feature convenient plug-and-play installation and fit like the OEM units. Available for ‘00-’03 FLHT/FLHR/FLTR and ‘00-’03 FXD/FXDWG; ‘04-’05 FXD/FXDWG and ‘02-’17 V-Rods. These stylish premium passing lamps combine rugged die-cast aluminum housings with a dark chrome retro-styled face. They are DOT/SAE compliant. A Predator III seat from Drag Specialties Seats “will give any bike a comfort and style upgrade.” The seat covers are automotive-grade vinyl and are available in a smooth or double diamond stitch design with black, silver or red thread. Molded flexible urethane interior and an ABS thermoformed seat base provide comfort. 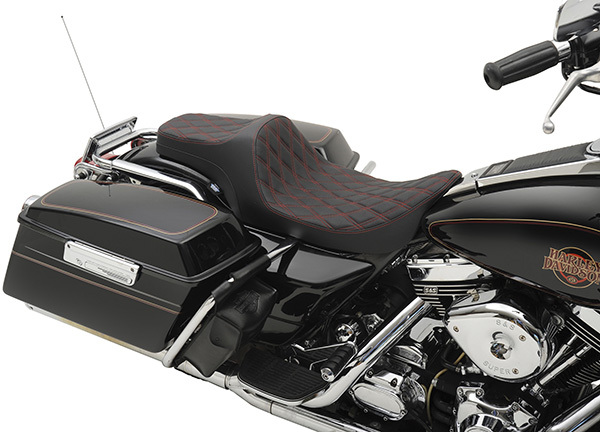 The seats measure 30 1/2” overall length and are 11 3/4” wide at the front and 6 1/2” wide at the rear. The narrower than stock front is designed to deliver better leg clearance on ‘99-’07 FLHT/FLHR/FLHX and FLTR models.